Local television in the U.S. saw massive change in 2013, change that remained under the radar of most Americans. Big owners of local TV stations got substantially bigger, thanks to a wave of station purchases. While the TV business profited, the impact on consumers is less clear and seems to vary from one market to the next. Still, the rapidly spreading practice of separately owned stations being operated jointly drew criticism from consumer groups and new scrutiny from federal regulators. The economic benefits of station consolidation are indisputable and include the increase in retransmission fees paid to station owners and the boost in stock prices of companies on buying sprees. But the effect on the quality of news coverage consumers receive is far more complicated to assess. And while the total number of people working in local TV news is at a near-record high, so is the amount of news their stations air. The average hours of weekday news programming actually declined slightly in 2012 (by six minutes), but that follows four straight years of increases and is still 46% higher than in 2003. What’s more, newscast time on weekends expanded by more than 11% on Saturday and 5% on Sunday, from 2011 to 2012.7 Another area of increase has been in the very early morning time slots. Stations airing news at 4:30 a.m. increased 11% in 2013 to 271, up from 245 in 2012, according to Nielsen data. 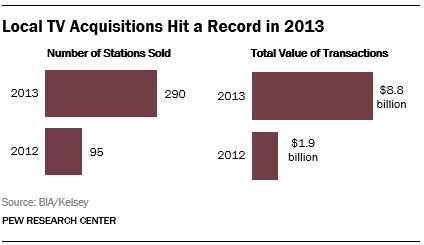 Those stations cut across 120 markets, up from 113 in 2012. In this report we examine the details of the massive rise in acquisitions–a phenomenon that flies under the radar of the average local television news viewer–the incentives behind them and the ramifications for the consumer.